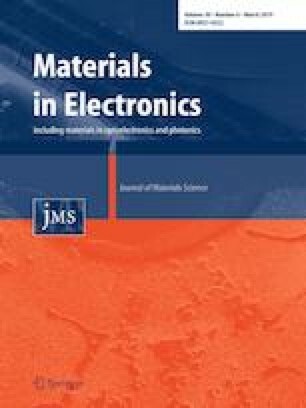 The synergistic effect of electric double layer capacitor (EDLC) and pseudo capacitive behaviour of camphor sulphonic acid (CSA) doped PCz-g-C3N4 electrode material for supercapacitor application is studied. The electrochemical behaviour of the prepared electrode material was analysed via cyclic voltammetry (CV), electrochemical impedance spectroscopy (EIS) and galvanostatic charge–discharge studies. The electrode material responded with the specific capacitance calculated to be 199 F g−1 at 1 A g−1 for negative potential window which proves that the material is highly efficient. The PCz-g-C3N4 nanocomposite was synthesized by chemical oxidative polymerization of carbazole using ammonium persulfate as oxidizing agent in ethanol and water media. The structure and elemental analysis were investigated by X-ray diffraction (XRD) and energy dispersive X-ray (EDX) spectroscopy. Fourier transform infrared (FT-IR), high resolution scanning electron microscopy (HR-SEM), high resolution transmission electron microscopy (HR-TEM) and X-ray photoelectron spectroscopy(XPS) techniques are also used to analyse the samples. The active PCz-g-C3N4 electrode material has porous structure and is a prominent material for supercapacitor application. One of the Author P. P, sincerely thank Mr. K. C. Dharanibalaji, IIT Madras for technical support. One of the authors S.A.M. (IF170624) thanks DST INSPIRE for financial assistance.